Paul McNeive is a man of diverse talents, with a truly inspiring story. Inspite of losing his legs in a fire Paul remained positive, and uses lessons in positivity, motivation and goal-setting acquired in rehabilitation hospital to inspire others. 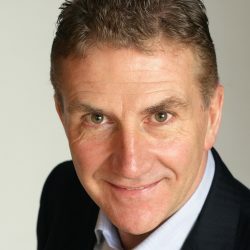 Paul has 30 years experience in professional services and is an accomplished speaker on client development, selling, leadership and winning pitches. Paul McNeive is an inspirational and entertaining speaker who makes an unforgettable impact on his audiences. Paul McNeive is a Chartered Surveyor, who started his career as a trainee in the basement of Hamilton Osborne King. Not even the loss of his legs in a fire prevented him from rising to the top position to lead 250 staff. Paul served as the Managing Director when the firm was sold to Savills for €50m. Paul is now a sought after Motivational Speaker worldwide, and works on business development with several leading companies. His autobiographical book on business and motivation Small Steps is a bestseller. In the book, Paul passes on the lessons in positivity, motivation and goal-setting which he learned in rehabilitation hospital, and which he has used to prove that “Everything is Possible” – for example, becoming the first double amputee in the world to gain a helicopter pilots license. Paul writes a weekly Opinion Column for the Irish Independent, has been profiled on The Late Late Show and is interviewed regularly on TV and radio. He serves on the board of The National Rehabilitation Hospital and has an ambassadorial role for The National Burns Hospital. Paul was honoured to be invited by Major Phil Packer to become a mentor for the British Inspiration Trust. With over 30 years experience, Paul is a rare breed as a Motivational Speaker from a background of professional services. He is also an experienced speaker on client development, selling, leadership and winning pitches. In addition, Paul works as a singer and in comedy. He has written No. 1 songs and sung on TV and radio including “The Late Late Show”, “The John Murray Show”, “The Mario Rosenstock Show”, “The Business” and the launch of “The Gathering.” This experience in entertainment makes him a great after dinner speaker, combining top level business ingenuity with the ability to entertain. Furthermore, Paul is experienced in hosting seminars. He loves working with senior management in facilitating strategy meetings, where his wide experience allows him to challenge the status quo, and stimulate new thinking.